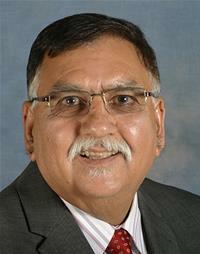 Raj Sharma was elected to represent Southgate ward in 2014. He moved to Crawley in 1992 and started working as a Neighbourhood Youth Worker at Crawley Youth Centre. In 2012 he became Centre Manager at Crawley Youth and Community Centre. Raj, who lives in Furnace Green, enjoys swimming, badminton, kite flying, travelling, collecting stamps and coins, but most of all spending quality time with family, friends and his three grandchildren.